Anticipation filled the air Wednesday, April 10, as upper school students and faculty gathered to wait for the 2019-2020 Second Baptist School Prefect announcement. Over 20 highly qualified students applied for Prefect positions to represent the Class of 2020. The Prefect system selects rising seniors to fill leadership roles at SBS. For years, Prefects have strived to inspire meaningful change around the school campus, in addition to elevating student culture and growing school pride. The Prefect candidates filled out extensive applications and interviewed before a selection committee made up of outgoing Prefects, administrative leaders and select faculty members. Just before the announcement of the new Prefects, SBS upper school students and faculty were fortunate enough to hear from one of our own. Sarah Harmeyer ‘95, founder and Chief People Gatherer of Neighbor’s Table, spoke at Chapel before a packed room. Sarah served as student council president during her time at SBS, before the Prefect system was in place, and therefore was clearly able to speak into the responsibility of taking on a leadership role at Second Baptist School. Congratulations to Second Baptist School’s newest leaders, the 2019-2020 Prefects! 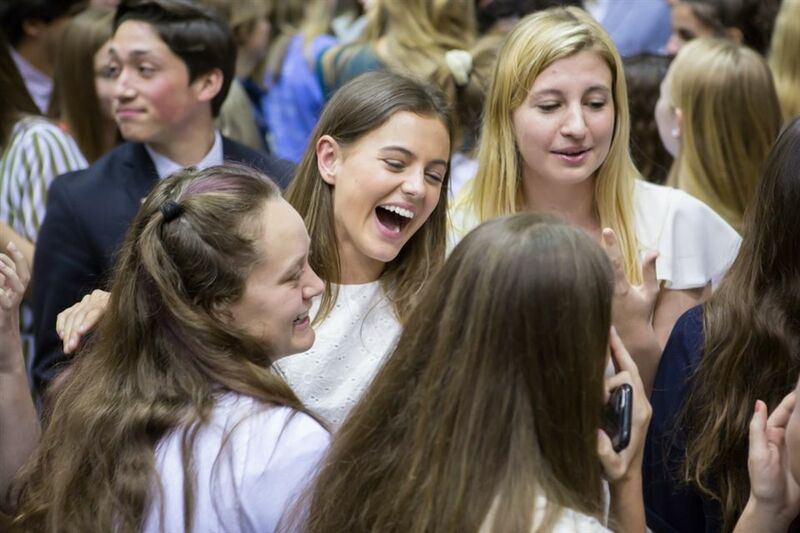 Click here to view photos from this year's Prefect announcement.